A new poll revealed that most moms would rather be *this* than "skinny"
Having a baby can take a lot out of you both physically and emotionally. And many woman experience changes to their bodies that they didn’t fully anticipate. While it’s empowering to realize that your “mom body” created an entire little human, some women admittedly find the changes hard to accept — especially in the age of “bounce back” pics and unrealistic “post-baby body” fervor. Which is why we’re so freaking glad that Planet Fitness polled 2,000 moms and discovered that a whopping 76% of them would rather be strong than “skinny” if they had to choose (not that the two are by any means mutually exclusive, but we get their point). The poll also revealed that 79% of the women felt stronger after having kids. These statistics are admittedly heartening to hear, and also perhaps indicate that more women are approaching their post-baby bodies with positivity and a health-centered (as opposed to “bounce-back”-centered) mindset than the media would have us believe. Many of the women polled also clarified that they don’t just describe “strength” as muscle. 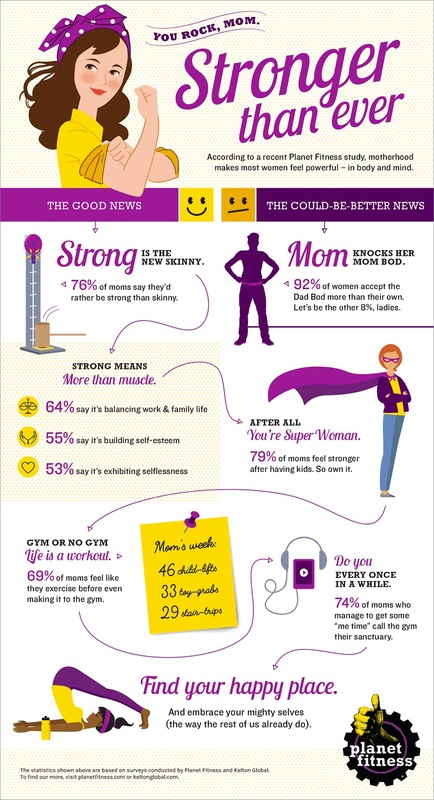 64% of moms polled said strength comes from balancing everything in life, and 55% credit self-esteem. And even if a mom doesn’t feel strong, the people around her tended to disagree. 74% of those polled view their moms as being the strongest people they know. Yep, that’s right — out of all the men and women out there, moms gets the majority of credit for being the strongest. Here’s the full infographic, in case you wanted to check out the stats. "Last year, our research findings helped the ‘dad bod’ make a pop culture comeback in a massive way, with the overwhelming majority of men and women both accepting and celebrating this body type. But those findings made us wonder whether the sentiment would remain the same across the aisle,” said Jamie Medeiros, Vice President of Marketing at Planet Fitness. It’s about time that attitudes towards postpartum bodies changed. The “mom body” is beautiful and something to celebrate!